This is a cool looking mod that you are going to want to get your hands on. The Spryte Pod Mod Kit by Aspire is going to assist you in getting the most out of your vape juices. Of course, this is a product that is being brought to us by the brand Aspire that never seems to fail in releasing new innovative hardware that just keeps impressing us every time. Well, this mod is going to have a compact size and still perform well. This mod works with a constant wattage output of 12W and depending on the coil, the voltage output may differ. The BVC coil has a resistance of 1.8ohm and works best with a voltage output of 3V to 5V. When it comes to the BVC NS coil, it has a resistance of 1.2ohm and it works best with a wattage output of 10W to 12W, but this is mostly when it comes to vaping with salt based nicotine. The aluminum construction allows this mod to be durable and the single fire button makes it easy to work with. This mod has a battery life of 650mAh, and since this the tank can hold up to 3.5ml of e liquid, you are going to be vaping for a long time before this mod needs more energy. The micro USB charging port will be there to add as much energy as your device needs to get you through the day. 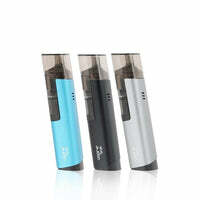 Spryte Pod Mod Kit - Aspire has a rating of 4.8 stars based on 5 reviews.